Rs. 60,000/- per semester plus Imprest of Rs. 15,000/- in each Semester in Greater Noida. Rs.15,000/- in first semester and Rs. 12,000/- in remaining 5 semesters in Dwarka/Rohini. RIG Diploma in Hotel Management followed by transfer during the course to our International Academic Partner Institute. Also facilitating admission in a Three Years Degree Programme. To be awarded by NCHMCT and filled as per their norms. Students who do not go to foreign institutions for some reason can complete their UGC approved degree programme. All our courses including short term courses have one semester of industrial training in five star hotels in India/Abroad. **Fees for foreign institutions are as per their norms. Details are available from our counselors. Our refund policy: No refund will be made after admission commitment fee and a semester/year fee has been paid. Students need to reserve their seat by paying initial part fee of Rs. 20,000/- (15,000/- for short term courses) to confirm his / her seat. This will be adjusted in fees of semester/year. Please note that fees once deposited will not be refunded under any circumstances. Fees for our courses can be increased in subsequent years, but not by more than 10% in any year. Imprest Includes Books, Stationery, Uniform, Kitchen Tool Kit, and emergency Medical Aid. 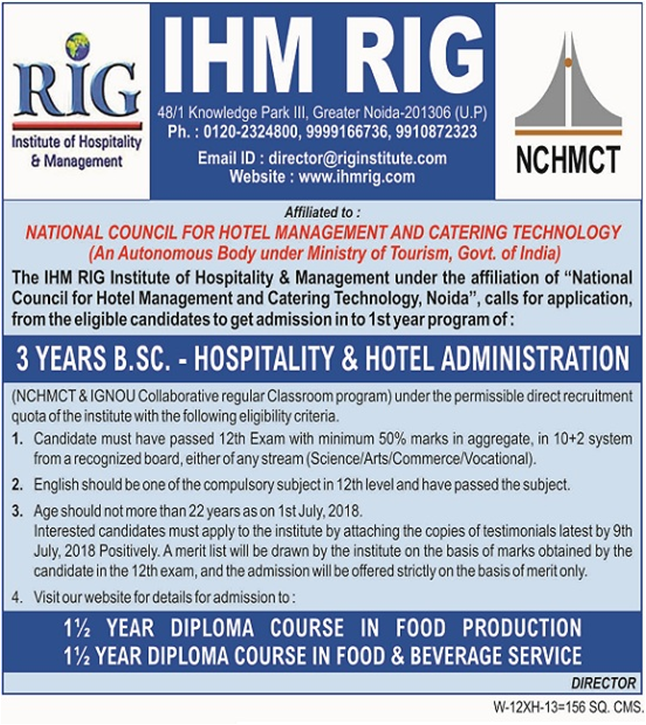 RIG Greater Noida is a study center for IGNOU.